I know, I know. 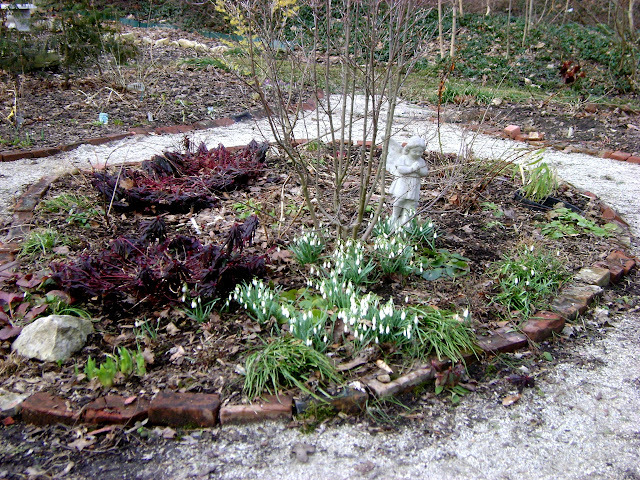 You are probably horribly bored of seeing Marion Jarvies garden over and over and over again. But I can’t help it, I love it. She is one of my plant gurus. Every time I visit I see something else I just have to have, darn it all. And this is one garden that I go out of my way to see every time I return from Barbados. 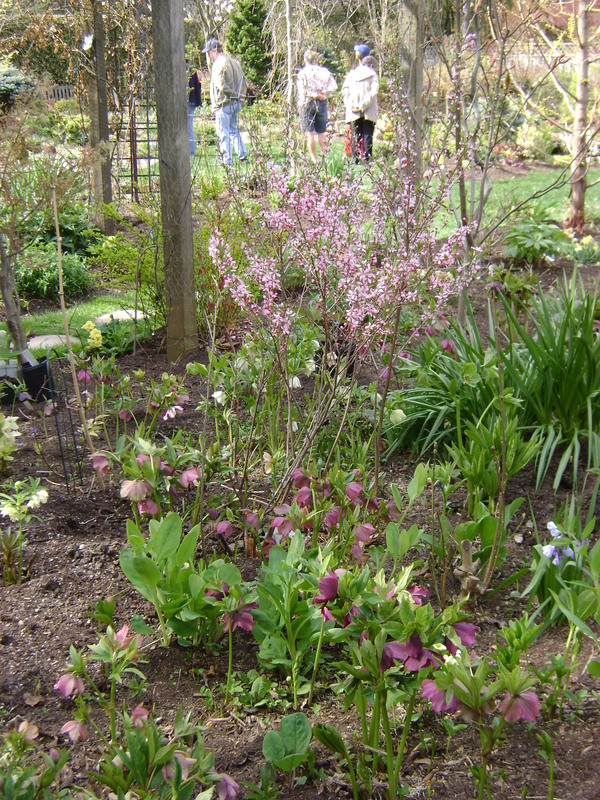 This time I was paying a lot of attention to shrubs and conifers in her garden, last year it was the hellebores. Not that I didn’t take a huge number of photos of them, but I was astonished by how much colour diversity there was in the woody plant material. Sorry, I did not get the names of the conifers. It was raining and we thought we would have to cancel the course so I ran around getting as many photos as possible. We did not have to cancel, but did cut it short so I am glad I did. 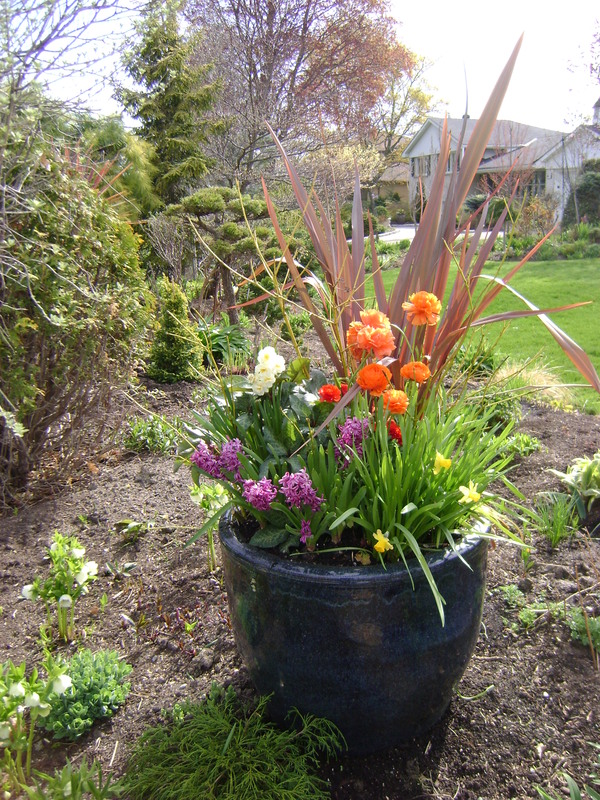 I soooo miss planting up seasonal urns, I even taught a few workshops on it when I worked at East of Eliza, one of my favourite jobs when I worked there. This is where my split personality comes in. As much as I love my friends garden and I wish it could be mine, then I see a new plant that I just have to have, and it throws the whole design out the window. 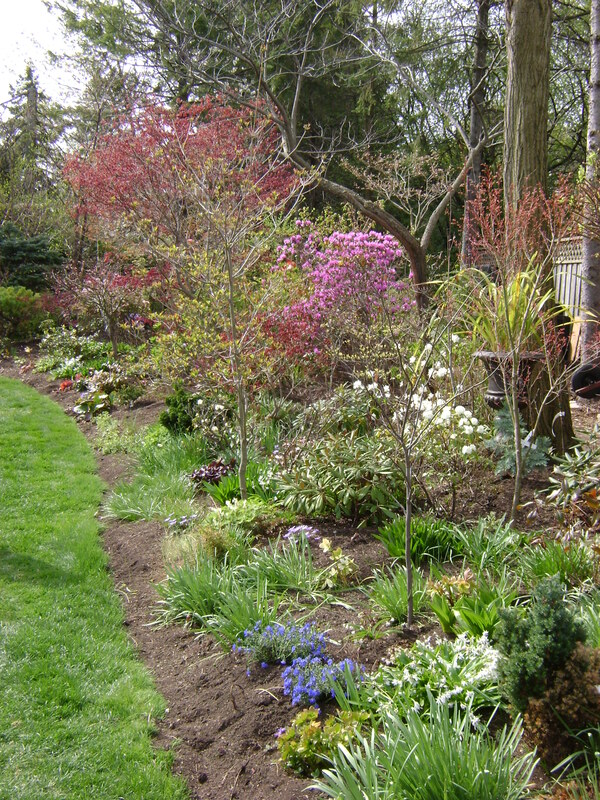 When I visited this Toronto garden with my friend Barry in the spring, I made a huge list of plants that I wanted. And it was long. And then got longer. 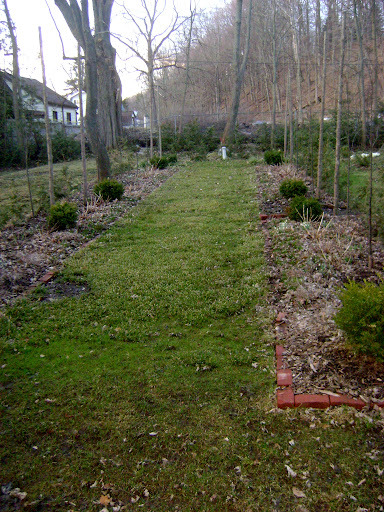 The design of this garden is a typical one, long borders running along the side for the whole length. of the garden But it is the plant material that makes it extraordinary. And certainly the use of colour. While the photos were taken at the same time of year as my friends garden, you can tell these photos were taken in the spring, while in the Rosedale garden, it could have been almost any time of year. However this garden does have a lovely little topiary feature near the end of the garden, enticing you to go and take a closer look at it. 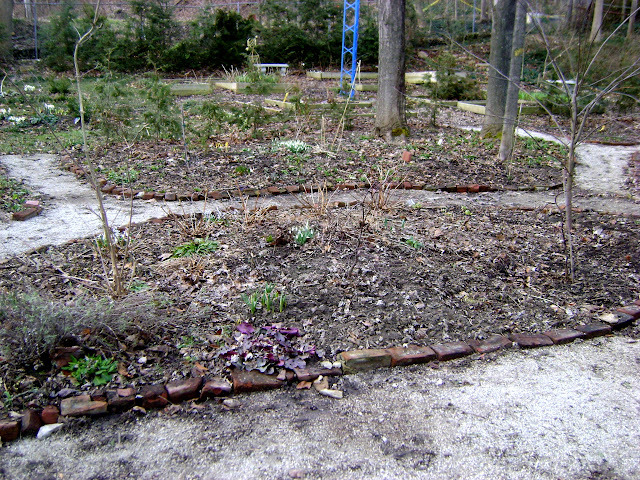 It also has the good fortune to back onto a ravine, who living in a city would not want this. Look no neighbours, only a lovely sylvan view. I love this sculpture, perhaps I could DIY something with a similar feel. A closer look at the topiary feature, but look at the glorious beauty of the Cornus behind it. This glorious Cercis canadensis ‘Appalachian Red’ had me wanting to dig up Old Stumpy. This Prunus came from Marion Jarvies garden and is a new variety named after her. Lovely colour. Every where you looked there was colour. And it was not all from flowers, look at how many coloured foliages there are in this garden. I shall certainly have to search out this trillium, isn’t she a beauty. This Erythronium was given to the home owner by Keith Wiley, it is certainly a lot larger then my ‘White Beauty’. When I saw Hosta ‘Fire Island’ I was blown away, made sure I purchased my own this spring. 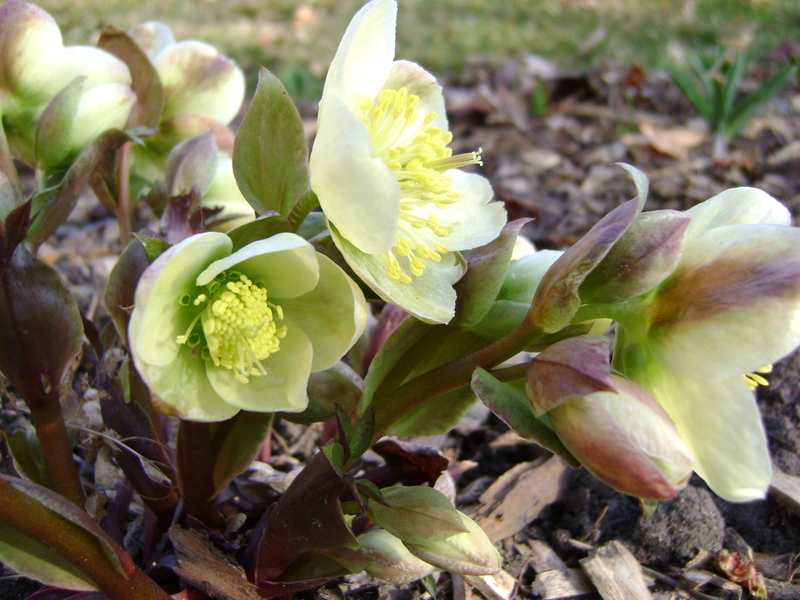 And I wished I had asked for the variety of this Helleborus, what great foliage. And I was happy when she told me this Arum seeds all over her garden. I purchased one a couple of years ago, and I would be a very happy girl if it did the same for me. So what do you think of my last two garden visits? Do you perfer a calm, serene, low maintenance garden with lovely formal structure? 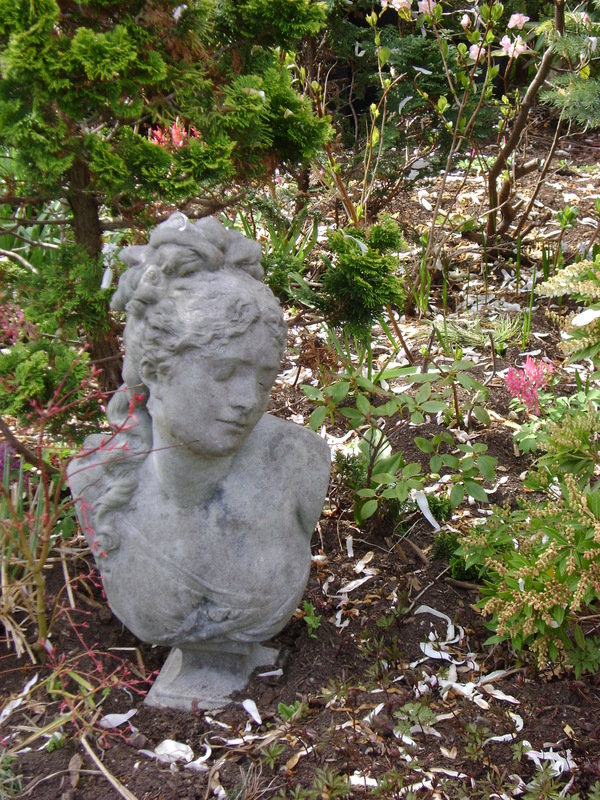 Or a collectors garden, where every day is different? I want them both! I have a multitude. 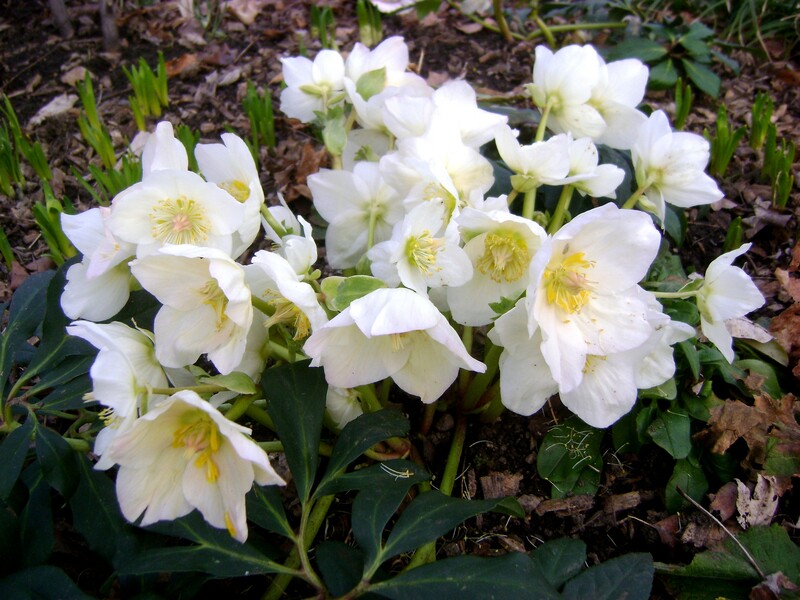 Not as many as I would like, I am a greedy girl, but 45 helleborus. Fortunately (from a design point of view) I have 3 different varieties. Unfortunately (from a collector point of view) I have only 3 different varieties. 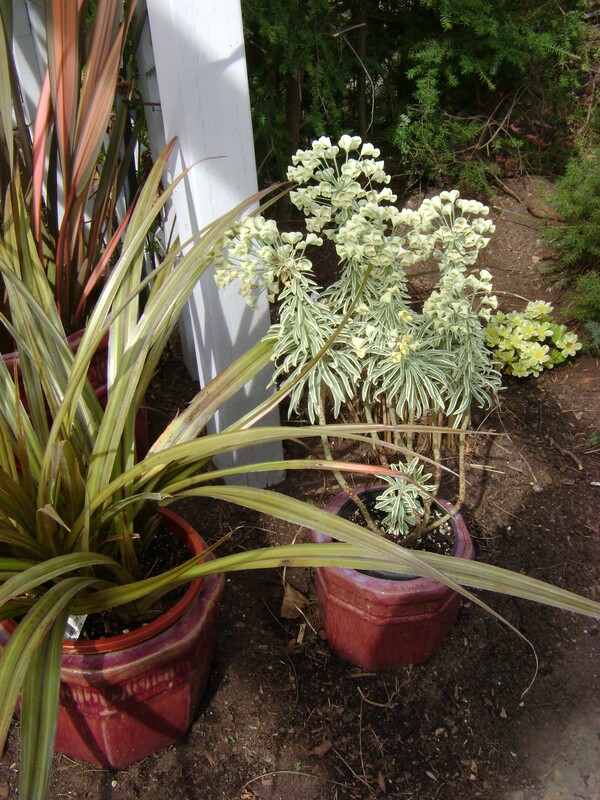 And to make to even worse, I have mixed up the tags, so I am not sure which plant belongs to which name. If any one knows, please let me know, and this mystery can be solved. From work (I love the free plants that are ‘garbage’ when the flowering finishes) I received Helleborus Gold Collection ‘Green Corsican’, HGC ‘Jacob’, and HGC ‘SilverMoon’. 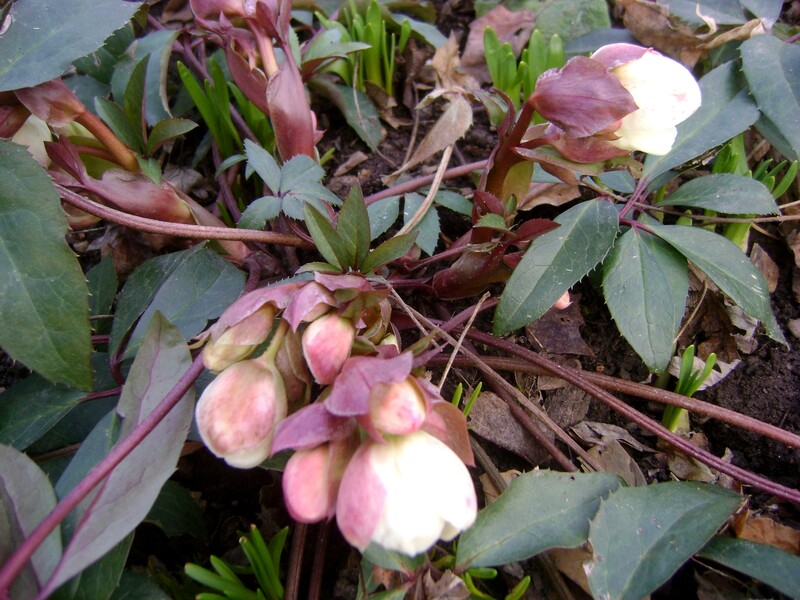 This Helleborus is the very first to flower. 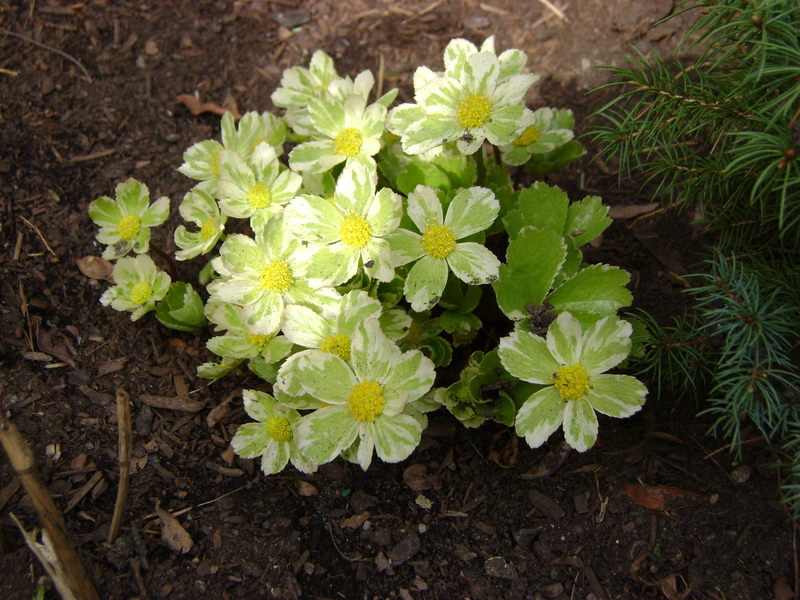 The white flowers, that age to green, appear on green stems. This is the next. 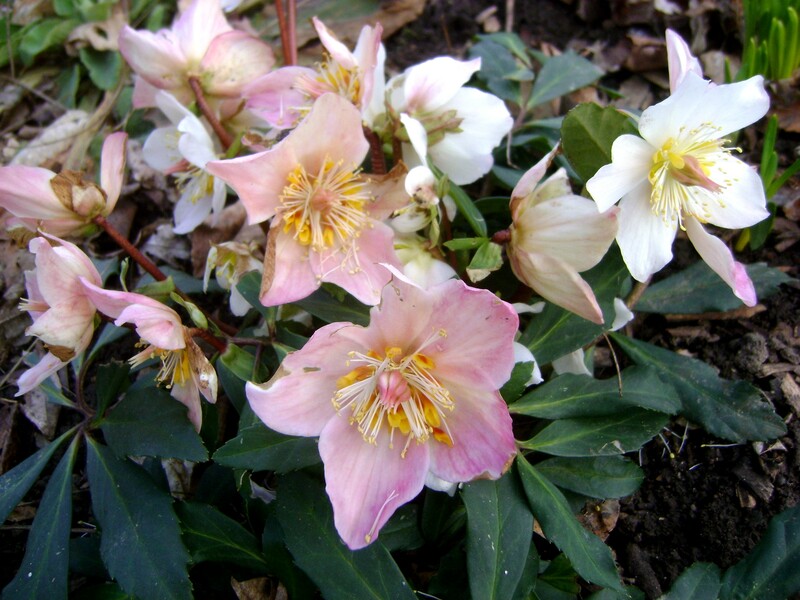 Again, white flowers, but they turn blush pink with age, and they appear on red stems. This (obviously) is the last. 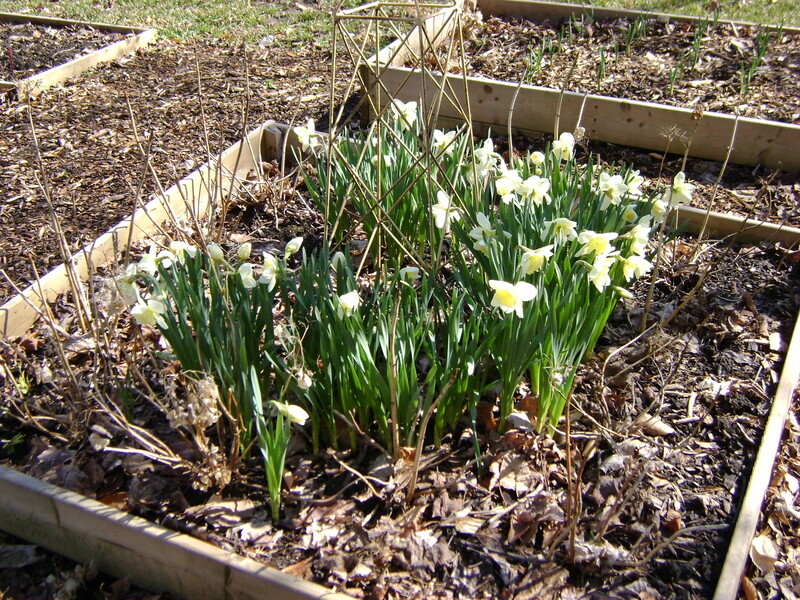 It flowers differently, instead of each flower bud arising from the soil, it has stems that are above ground all winter, and they are multiflowered. Can you tell the difference, I can’t tell the difference? P.S. They have now been identified as #1- Green Corsican, #2-Jacob and #3- SilverMoon. Thank you everyone for all your help. Can you ever visit the same garden too many times? 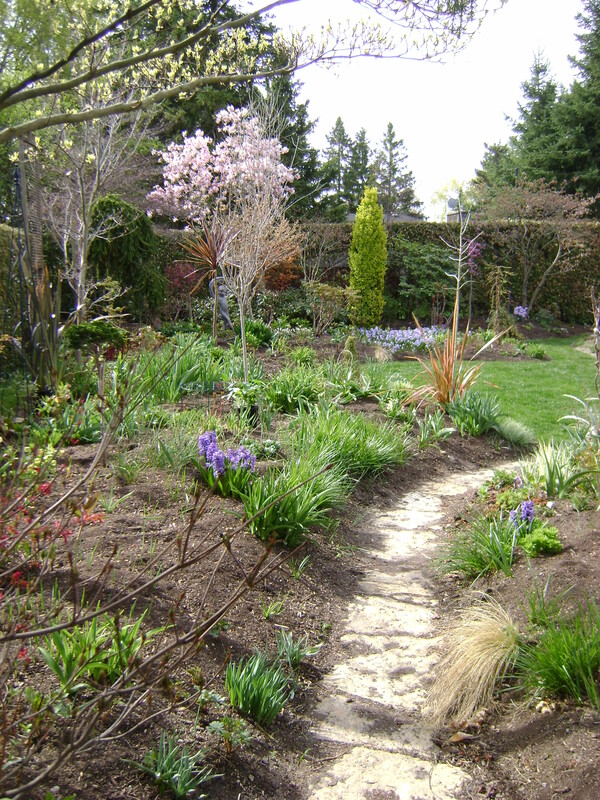 Not when they are as clever a garden designer as Marion Jarvie. It is always interesting to see a garden at different seasons, you can pick up so many ideas for keeping a succession of bloom. She opens her garden four weekends a year, April, May, July and September. 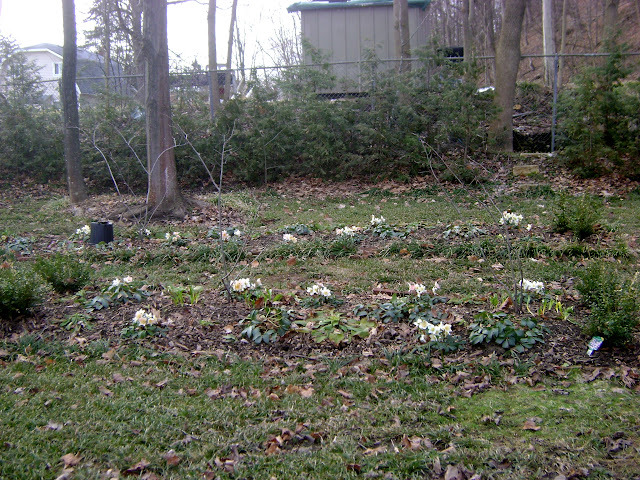 My last visit was to her garden in May 2009, you can read about it here. I had taken a course with Marion titled “Early Spring Bloomers” back in February, I wanted to see some of the plants that she mentioned in her lecture in real life. 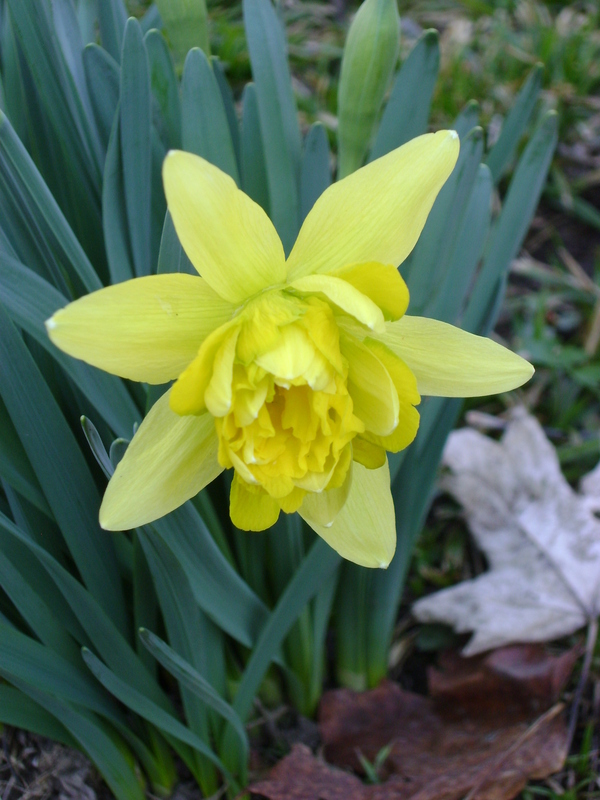 But spring is so advanced this year, they had all finished (always next year), but there was certainly lots to see. Even with not a lot of flowers, there is so much colour here, a lesson for me to learn. 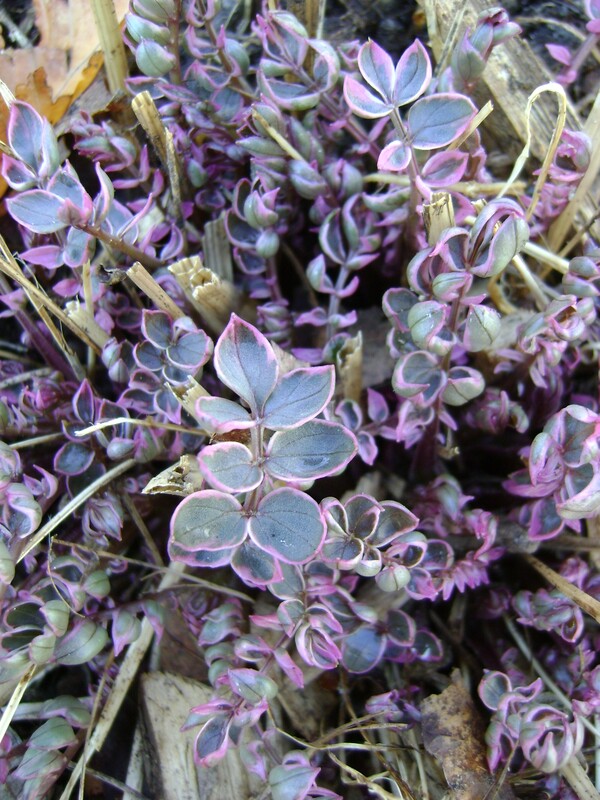 Get more coloured foliage into the garden, not just green. It seems like so much space between the plants, hard to believe it will be cheek to cheek later in the year. 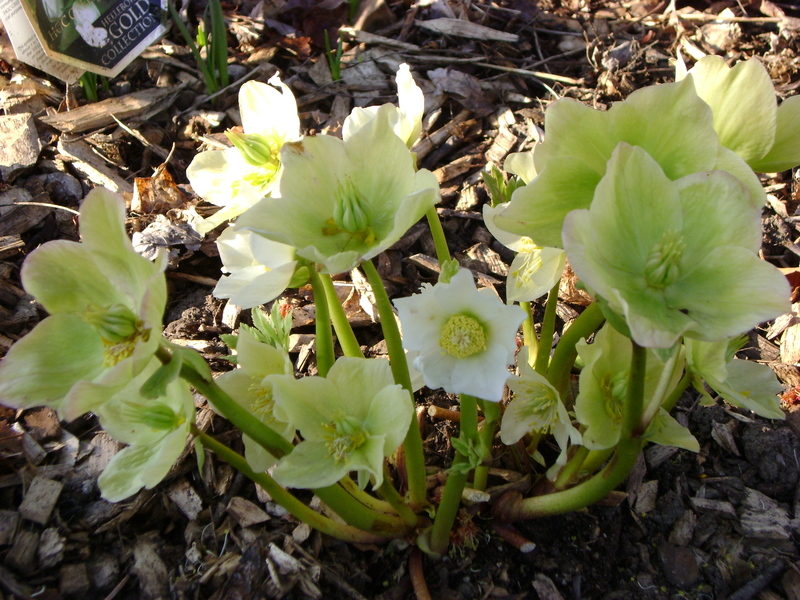 Marion has quite a number of hellebores in the garden, some of which she was selling. I arrived early I thought, shortly after 10, and she was almost sold out at that time! The long view towards the back of the garden. In the summer, you can hardly see this path. 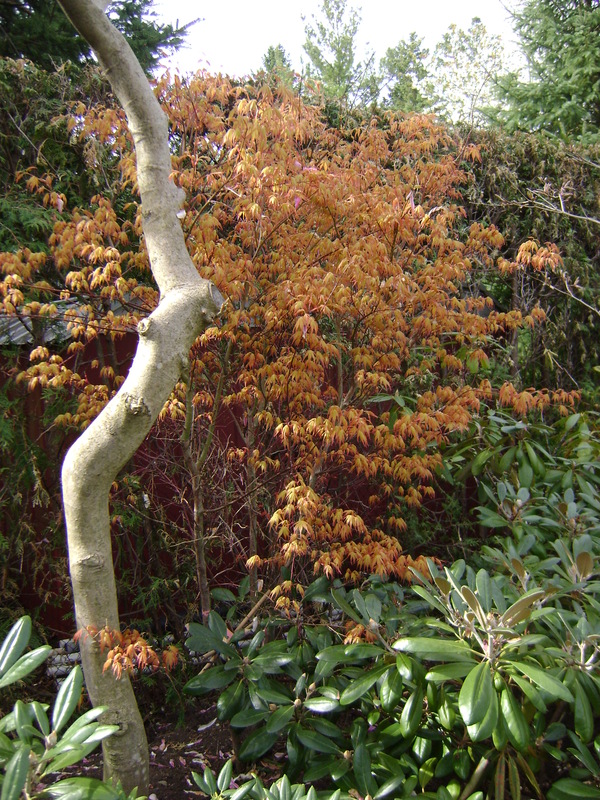 Japanese maples are so colourful, she has a number of them in her garden, love this orange. 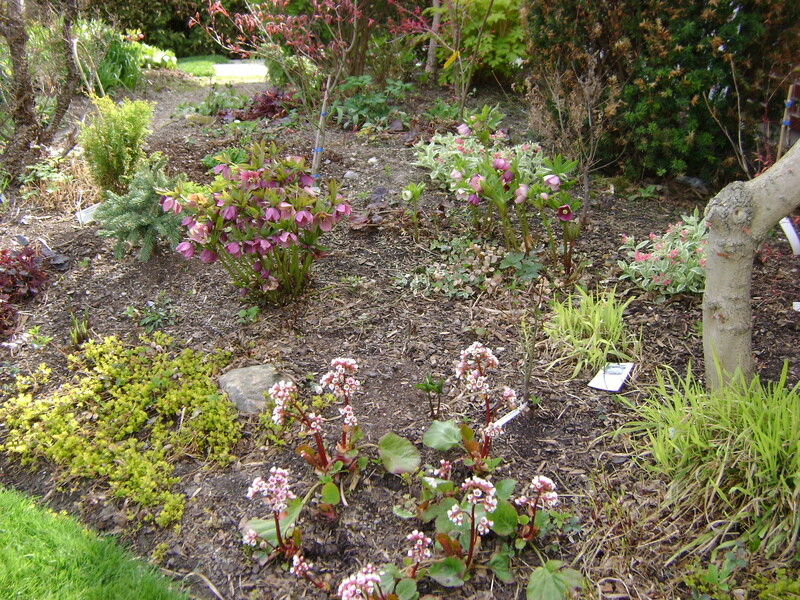 The long view on the opposite side of the garden, look at how much colour, but not a lot flowering, a great lesson. This statue wasn’t there last year on my visit. But this one was. 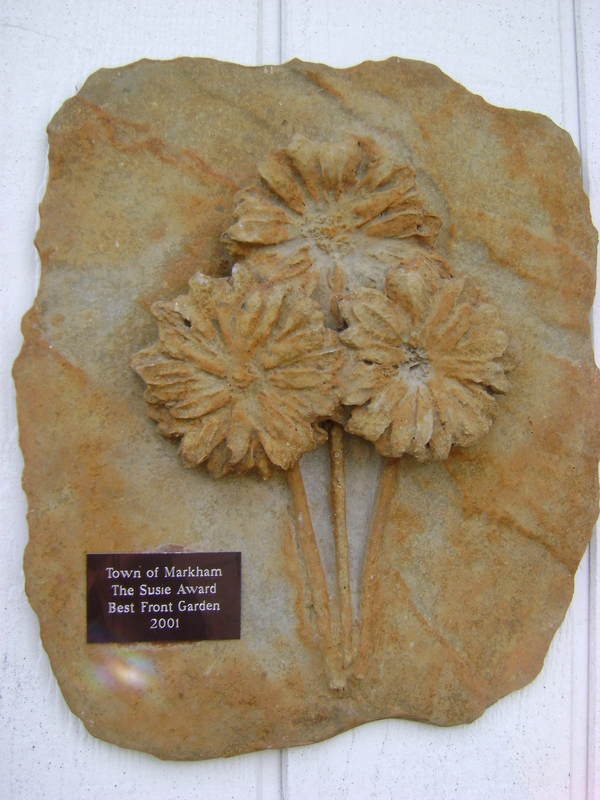 Art in the garden really adds another dimension to it, any time of year. This massive pot is in her front garden, she changes it a number of times during the year. 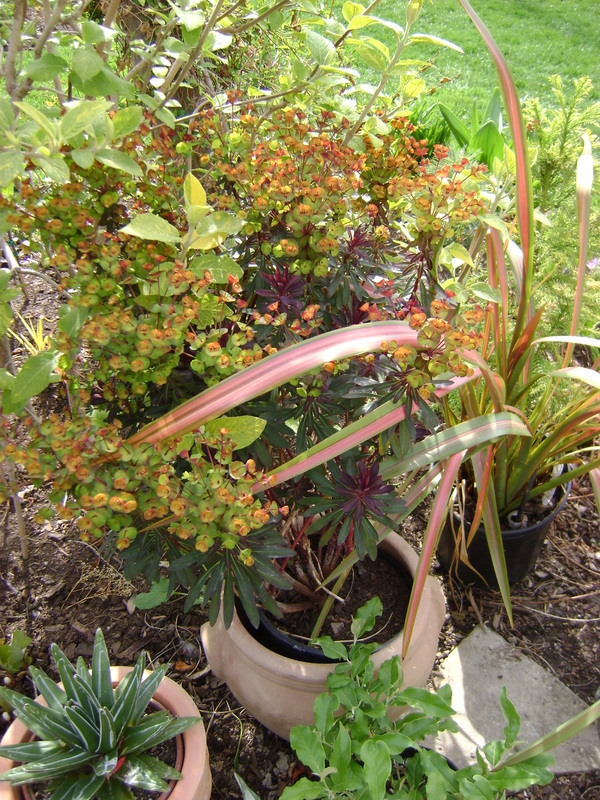 same plants, phormium and euphorbia, just another colour scheme. 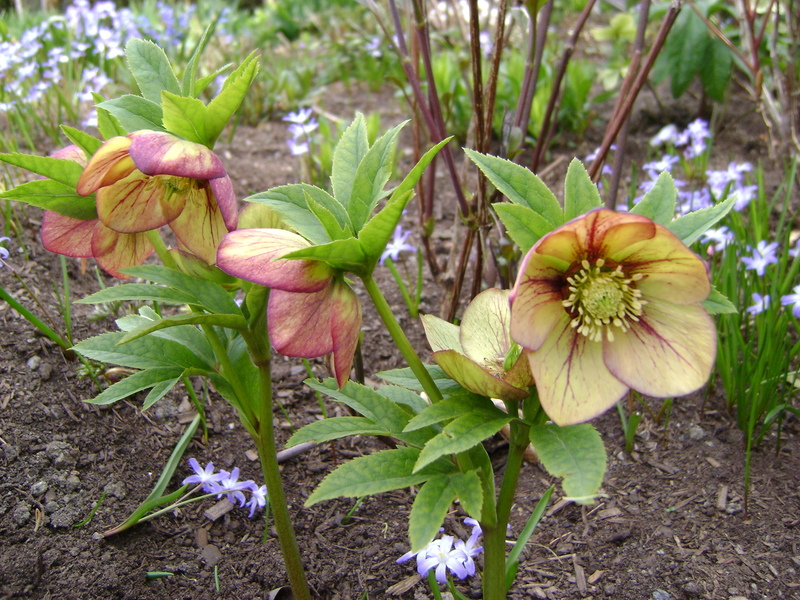 Marian had hundreds of hellebore in flower but this one caught my eye. I’m sure you wanted a closer look! This plant also caught my eye, I know that I have seen it before, but do you think that I can remember the name. I am sure that someone will let me know, at least I hope so! You can get another perspective on Marion’s garden by reading Barry’s post on his visit (and his photographs are a hundred times better then mine, so please visit him). 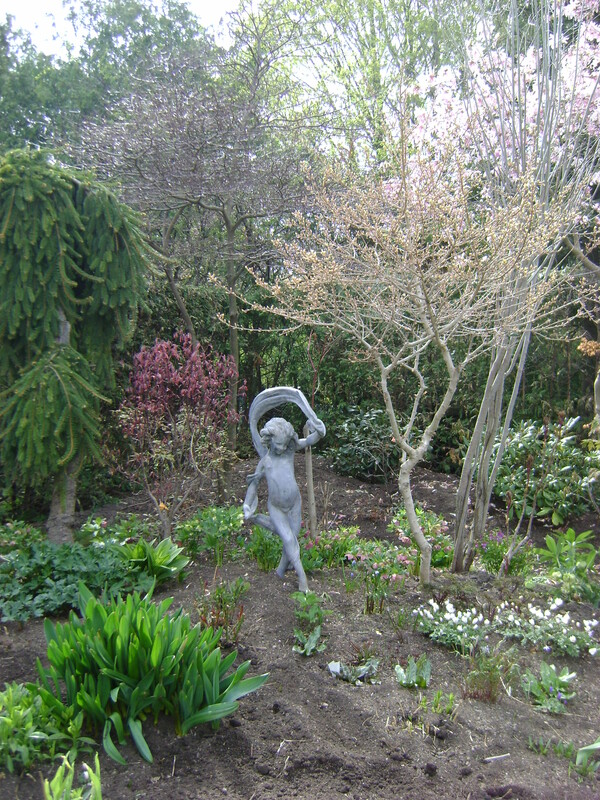 The next time her garden is open is the weekend of May 29/30 from 10 to 4, rain or shine. 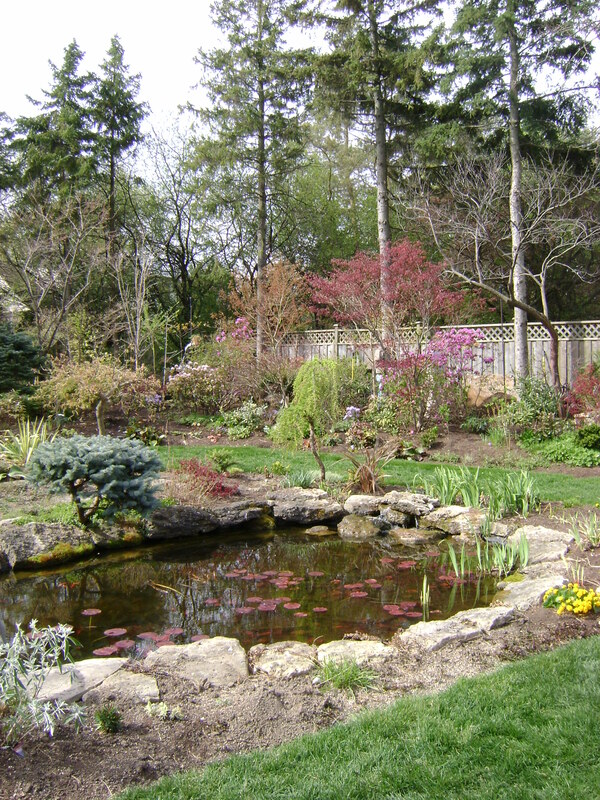 The garden is located at 37 Thornheights Road, Thornhill, which is located near Yonge and the 407. Be sure and bring some money, Marion and Alex sell some amazing plants, a lot of which are sourced in Quebec and not commonly available in Ontario. It has been an amazing March and the first two weeks of April. 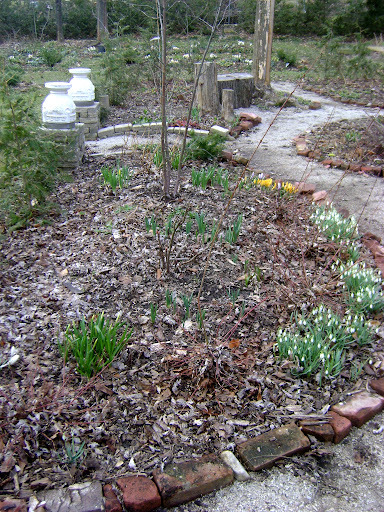 When I check my 2009 garden journal, I am finding the garden is 3 weeks ahead from last year. And in 2008, there was still snow on the ground the first weekend in April. However, Kilbourne Grove still looks a bit blah. I need so many more bulbs, (and to win the lottery)! Carpets of them! This is the only bulb that was here when we bought the house. Does anyone know what it is? But next year I should have some more colour, these are all “free” forced dafs that I planted in the Kitchen Garden to recuperate. I will move them out after they are finished flowering. 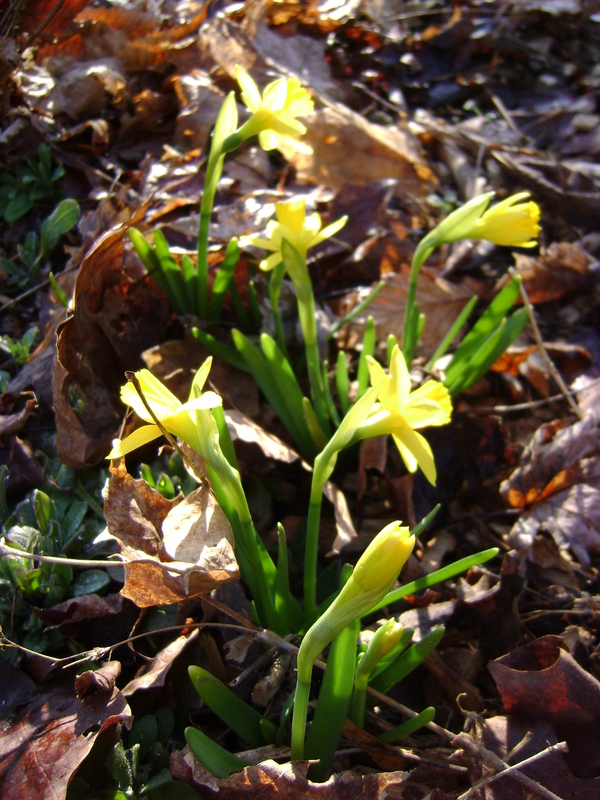 These Tete A Tetes were from three years ago, they are now very happy flowering in the Flora Glade. A few perennials are coming up, but nothing is as beautiful as this Polemonium “Touch of Class”, the leaves are purple and turquoise. But it is the Serviceberry Allee that is the most showy this time of year. 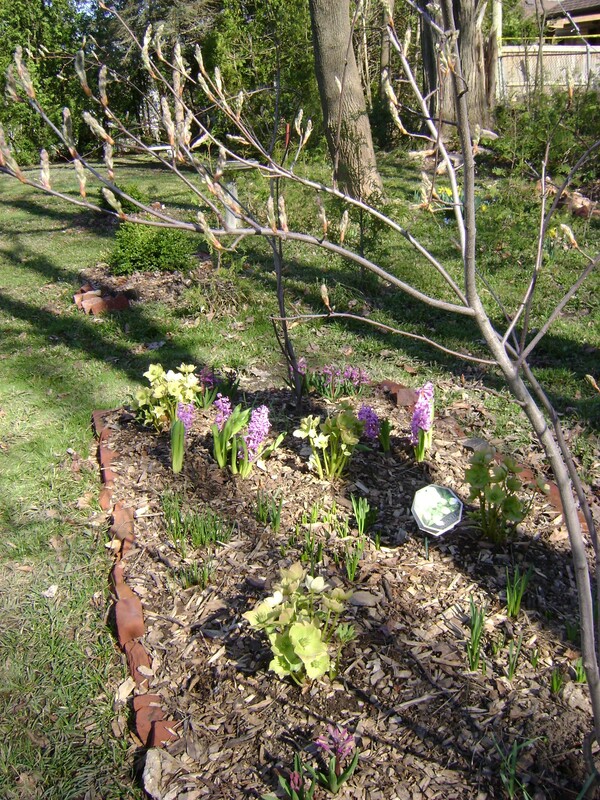 The helleborus have been joined by hyacinths. And it looks like the Serviceberry will be in flower soon. while Helleborus “Jacob” started two weeks ago. What great plants these are, flowering for 6-8 weeks, maybe even longer. I do not think there are any other perennials that have that longevity. I am definitely going to get more for my garden. 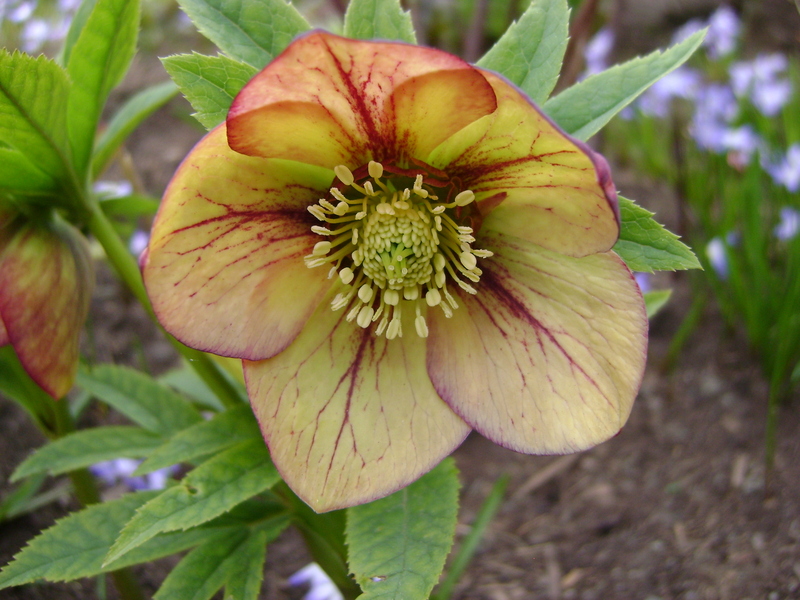 Hellebore mania, here I come!